There are some great options for flyfishing Miami for tarpon: Migration Tarpon, Miami Night tarpon and channel/beach tarpon. I fly fish for these tarpon in Miami starting in April most years along the oceanside of Miami’s Biscayne Bay, ending in July. The first schools of fish are fresh and haven’t been pounded. These “oceanside swimmers” are an incredible sight as they lazily swim in crystal clear water and daisy chain their way south to the Keys coming from as far as Virginia’s coast. Yeah, this is the stuff you see on TV. Presentation is everything with flies and stealthy tackle a close second. I have found over the years that books and videos are great for entertainment, and you might pick up some quick tips. Having said that, I won’t go into casting-presentation here since you'll forget 99% of that the first time 75 fish swim towards the boat. My point is, you just gotta be there - then we will open class and you will learn the trade once you get over the knee knocks. Rods: 9wt-10wt-12wt rods, depending on conditions. Floating clear lines and sink tips preferred. Flies: 1/0-2/0 hooks chemically sharpened. The fly patterns are endless, keys style types/bunny tails/marabou/toads and more. The best bet is to send me an e-mail to discuss or pick a pattern and let’s use it. Generally we use dark colors on dark days/times bright colors on bright days/times. Leaders: see my tarpon leader page by clicking here, 50-60lb shocks dominate. This is, at times, a great way to learn how to fight a large tarpon on fly and present the fly in a “river like” situation especially when you have limited time or are busy during the day. The season normally is from November until April. It’s all about bait runs, weather and the mood of the fish. Once on the water I will stop the boat, we will discuss the night’s techniques and safety issues. Shrimp and crabs scuttling by are why the tarpon are there and when the fish are feeding the fly pattern won’t matter. But for starters a fly in white or brown is a good choice. Rods: 8wt and 10wt rods with floating line/sinking line optional. Flies: 1/0-2/0 hooks chemically sharpened (only), white tails/white collar’s or brown. I like two mono eyes protruding out the back with a mono loop to prevent the tail from wrapping around the hook. Bring a shrimp pattern too, I have one that’s easy to tie and the tarpon eat them up at times. Leader: 8wt rod, straight piece of 40-50lb leader, 10wt rod 16-20lb class tippet tied to a 60lb bite tippet. This type fishing is not fly fishing to me, just my opinion. Too many ships, power boats and noise. There are lots of guides who make a living doing this - I would refer you to them. To read about Fly Fishing for Tarpon in Everglades National Park with Capt. Dave Hunt, click here. 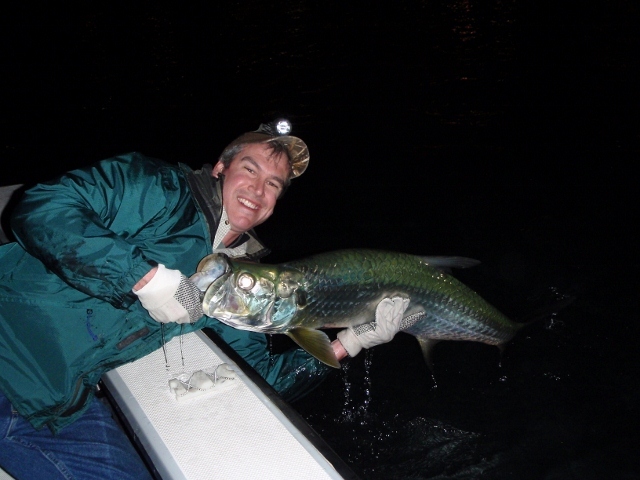 To read about Fly Fishing for Tarpon in the Florida Keys with Capt. Dave Hunt, click here. To check out my tarpon leader system, click here. For illustrations for tying the super blood knot, click here.